Rev. 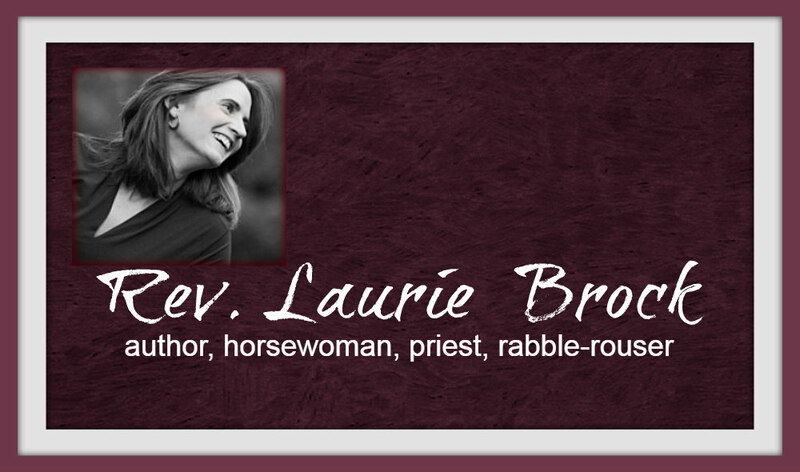 Laurie Brock: Shout out from PeaceBang! Wow, this is like finding a kickin' pair of heels on sale that are comfortable and that go with your clericals. Nothing like positive reviews. Kiss of peace to you, too, Vicki. Hi, Laurie and Mary. How could I not like your blog with such a title? I'm in Thibodaux, LA. It's good to see a couple of other female rebellious types in my territory. A friend from England pointed me to your blog and then another from the East Coast of the US. I'm in a rush now, but I'll give you a link on my blog when I have time. In the meantime, welcome to Episcopal blogland. Love the blog... made me laugh out loud!! I've only Mimi's friend from the East Coast to blame, but I think yer blog is finer than frog hair, especially the title: heh. I found you through Peacebang and just want to say I love you. A colleague from SW PA mentioned you on facebook and then Peacebang mentioned you the same day, so I came over to have a look. Now I'm the one mentioning you on facebook and blogrolling you! Blessings on this ministry and all your ministry! Thank you so much for your comments! We are feeling the love. It is so nice to know you all are out there. Happy Easter! I will vouch for the quality and fit of a black suit from Banana Republic. In fact, one of your gruesome-twosomeness was there when I was outfitted for my second one whilst we learnt about Jesus in Chicago. She claimed the cut was too...worldy. Alas, now that I, instead of IDAPP, am the buyer, I've had to slum it with rather frumpy shapeless numbers from Joseph Banks and Perlis. Not every clergyman in edola can afford Prada.